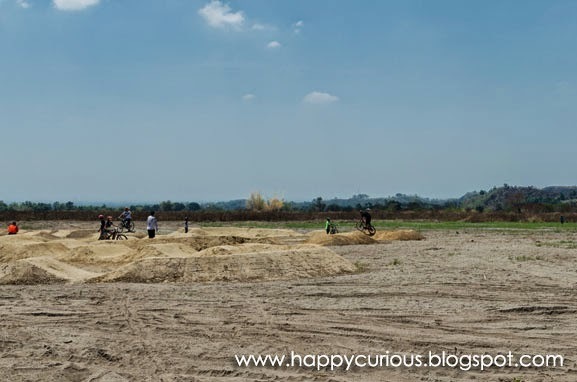 Me and my cousins had a fun Saturday last week at the newest adventure park - The SandBox at Alviera. Instead of having to spend the time lounging at home, I was glad I got to experience some physicall challenges and even learned a new skill. 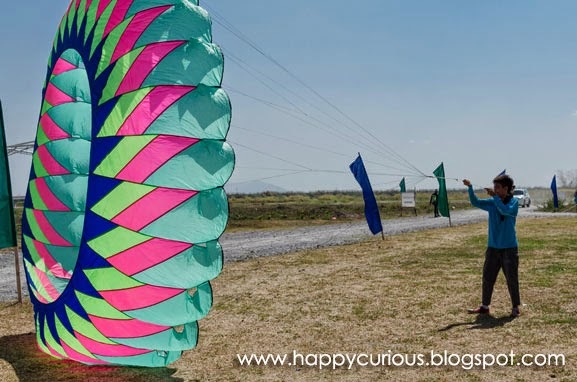 Alviera is "a 1,125-hectare township designed to seamlessly combine urban living with nature." We had nature surrounding us indeed as mountains and vast meadows greeted us everywhere we looked. 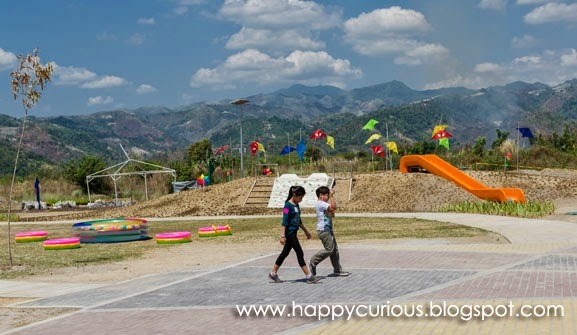 The Sandbox is its first development featuring facilities that can cater to the whole family. 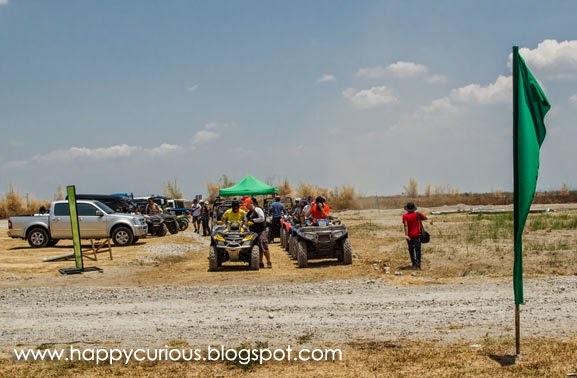 It was a rather long ride to the location in Porac, Pampanga from Quezon City but the fun we had was worth it. We weren't able to try all of the attractions because we had to take a lot of time out from the glaring sun but what we still had a lot of fun. Upon arrival, we were greeted with these colorful parachutes. It looked hard but fun to hold these down and it was tempting to try it for ourselves but we didn't want to be dragged around the sand for our first activity. Instead, we admired how these guys made it look so fun and easy under the hot sun. The first thing we noticed upon entering the facility was the tall tower in the distance. 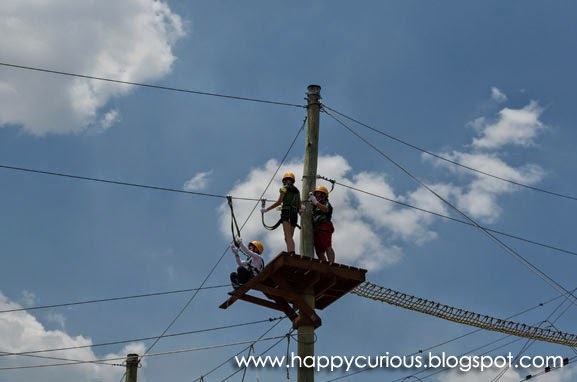 It was the Adventure Tower, a 5-storey structure for activities such as wall climbing, rappelling and free falling which we decided we'd try last. It was also a great view deck for avid photographers who would like to take pictures of the vast landscape. This tower is also the starting and end point for Avatar One, "the Philippines' first roller coaster zipline. 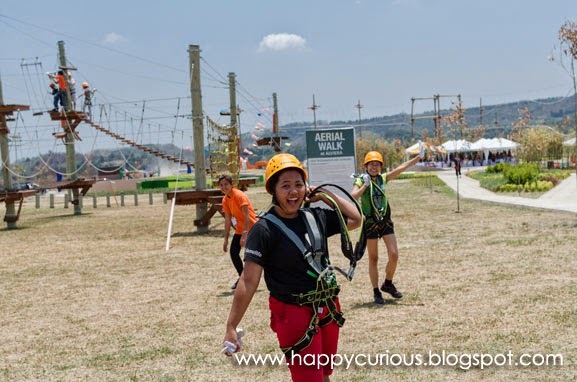 One doesn't just zip down the 180-meter course but zigzags along starting from 12 meters high." At the time however, the roller coaster zipline was not available for guests. I was so looking forward to this but the other activities made me forget what I missed. There were also places for kids to have fun like slides, an actual sandbox, water guns and kite-flying lessons. For bikers, there is the 5,000 sqm pump track to play around in or serve as training ground for all types of bikes and skill levels. 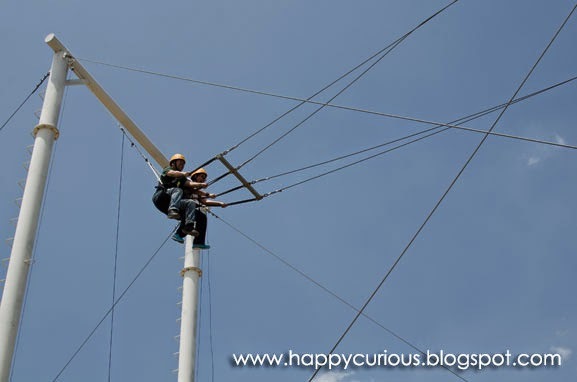 The first thing we tried was the Aerial Walk Challenge which "is a series of activities that will test each user's agility, balance and flexibility. An active guest can make his way through the course in about 30 minutes." I think we made it in less than 30 minutes and with only our bare hands for half of the obstacles. We we're glad that we we're quickly provided gloves when we reported it even when we were in the middle of the course. I guess our excitement got the better of us and the attendants who put us into our harnesses. So, here we were, all harnessed up and ready to tackle the Aerial Walk Challenge. 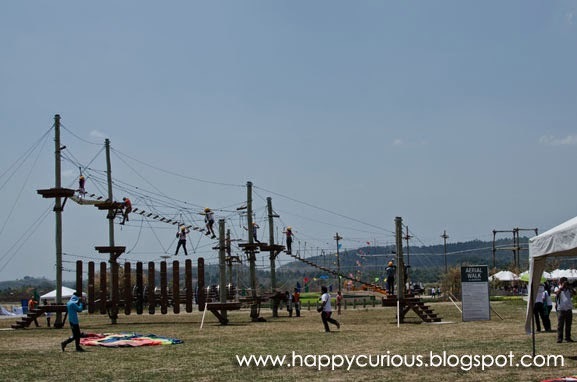 The whole thing didn't look too intimidating but once you start the course, you will really feel your muscles working. 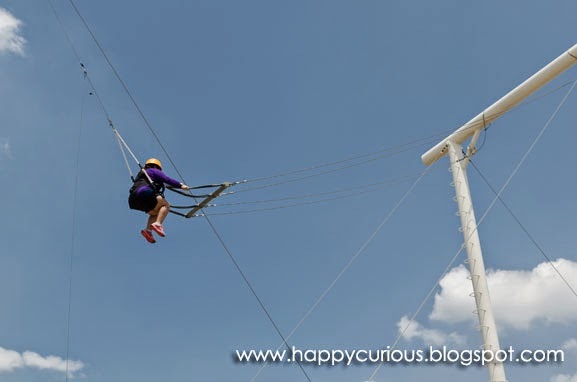 We had to climb on ropes, walk on unstable bridges, walk on wires (I was looking for a balancing pole on this part), climb on unstable rope ladders, swaying plank ladders (felt like going up a pirate ship), and pull myself in places where my weight couldn't help me accelerate. But the best part was when you got to the top of the highest tower where you then ride down via a mini zipline. 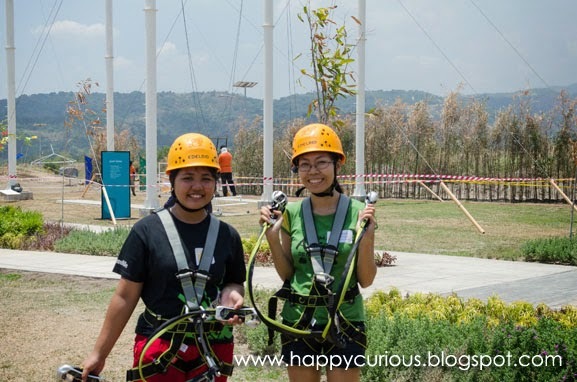 Here's me and my cousin finally reaching the topmost tower and getting ready for our zipline ride. Finally, we finished the whole course with satisfied smiles of course! After this, it was lunch so we had some rest. Then we tried out the ATV. 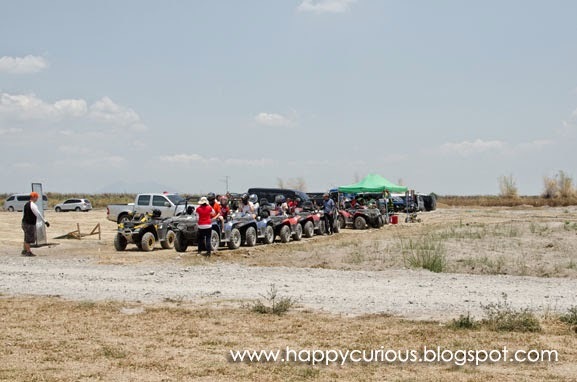 Here's a snapshot of the ATV riders before us. I was excited to try this out but I was nervous at the same time because I had never driven anything except a bike. Fortunately, it was easy to learn how to drive this and I was going in zigzags at first but I quickly got the hang of it and the rest of the ride went smoothly, albeit really dusty. The helmets we're a great help so we could still see and not eat dust while being led through the course. The whole course is 45 minutes to an hour but because they wanted to accommodate everyone, they reduced it to 15 minutes. If I learned to drive an ATV in less than 15 minutes, then I had hopes of learning to drive an actual car. Riders can choose 2 types of the vehicle. One is the ATV and the other is called a UTV but both can ride 2 persons. I chose the one resembling a car rather than the one where you ride like in a motorcyle. I felt safer in the car model since there were steel frames to protect us in case we toppled over. I wasn't confident in my driving skills when we started. I was planning to just go along like a turtle and let all the learned drivers pass us by. But since learning how to drive it was easy, I was going along with the rest of the group just fine. Not first, but not last either. 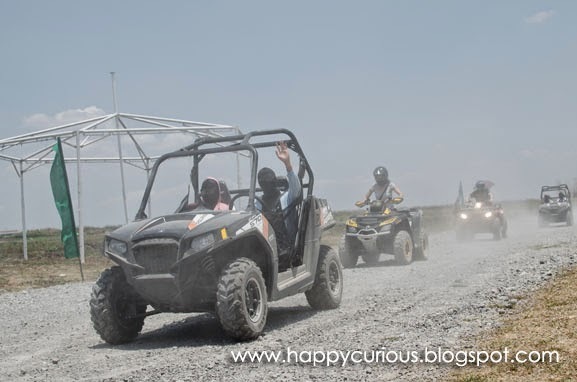 "Eat dust" was really a part of the experience because the track was sand and soil all the way. It didn't matter if you were in front or behind, you still rode through dust as you go through the course. 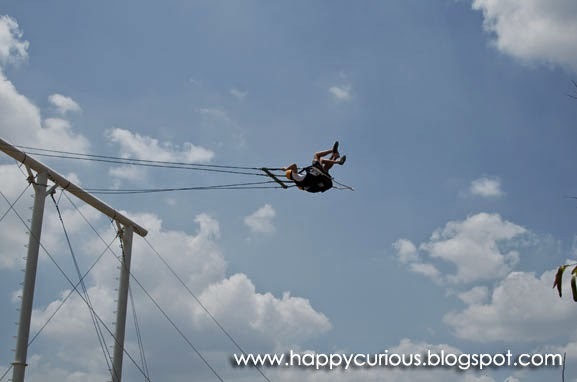 After a satisfying ATV ride, we dusted off a little and decided to take a milder fun ride via the Giant Swing, supposedly the country's tallest swing at 10-meters above the ground at its highest point. You can choose to ride alone or with a partner. Me and my cousin chose to ride as partners. We thought we could relax with this ride but we we're so wrong. Once you are harnessed, you are then pulled gently to the highest point of the swing to begin your ride. Now the pulling up part was slow but thrilling at the same time as you get to see how high up you already are. The death-defying part was the moment the pull was released. It felt like a few seconds of free fall (or close to dying, really) as you feel the harness and the seat of the swing separate from your body. You feel like you don't have anything to hold on to. Then you are together with your harness and swing chair again and then you feel separated from them again at the opposite end. Gladly, that was only for the initial swing, the next ones you can solidly feel the harness and the swing seat supporting you. But those few initial moments elicited the most shouts and nervousness. I wasn't planning to do any shouting as I had already no voice left from my cold but the swing seemed to have pulled out the last of my voice and then I had no voice left to even express my self after that. 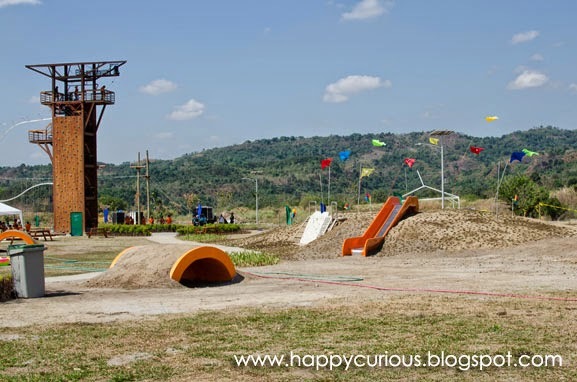 We we're planning to try out the Adventure Tower but we wanted to get back early to QC so we said goodbye to The SandBox, grateful for a fun weekend. When going to The SandBox be sure to have your hat, put on sunblock, bring a fan and an umbrella, have lots of water to hydrate you, extra shirt/s for changing (clean comfort rooms are available), a camera for recording the fun moments and outdoor scenery and get ready for fun and adventure. 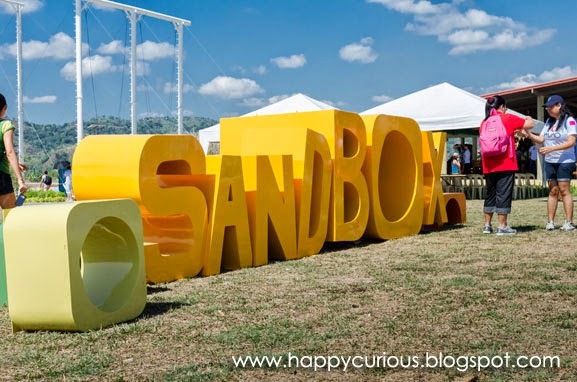 The SandBox will be officially launched tomorrow April 12. It is open from 9AM-5PM. For booking guidelines and details visit their website or their Facebook page. All quotes are from the press release documents provided during the soft launch event (April 5, 2014). Photos taken by my cousin. Visit his photoblog for more of his pics.